Lazaro takes pride it decking our patrons out in the most striking garments available. Our Men’s Long Sleeve Shirts are unique creations meant to catch the eye and present a demeanor of confidence and leisure. Each shirt is crafted with the same high-quality design and materials necessary to be considered a Lazaro product. For this shirt KMRii took a classic to the next level. This 100% cotton shirt features a color discharged treatment on the sleeves and waist as well as a shirring cut on the sides that create a natural slimming effect. This classic, easy to wear top features a shirring style cut that slims and defines the waist. The solid black color makes this shirt perfect for almost any pairing. Perfect for summer, spring, or fall this lightweight linen shirt is the epitome of KMRii's boundary defying design aesthetic. Sleeves and waist feature a hand-discharged treatment that changes the fabric from black to white, revealing a look that is both modern and timeless. 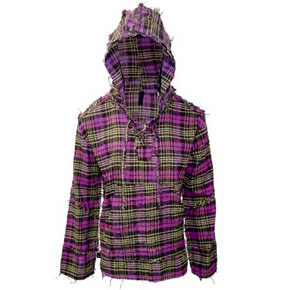 Striking prewashed flannel hoodie in magenta purple, black and yellow. This fashionably hoodie features a deliberately raw and frayed texture and also has pockets and a hood with destroyed tie neck detail. This style runs small, it is recommended to choose one size larger than normal. 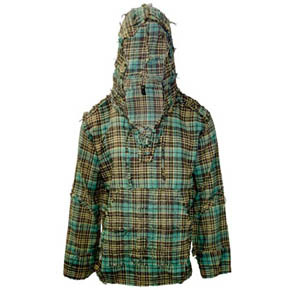 Prewashed flannel hoodie in green and brown with distressed frayed texture. 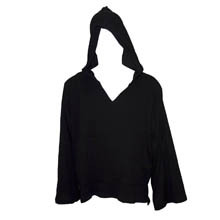 This fashionably frayed hoodie features pockets and a hood with destroyed tie neck detail. This style runs small, it is recommended to choose one size larger than normal. 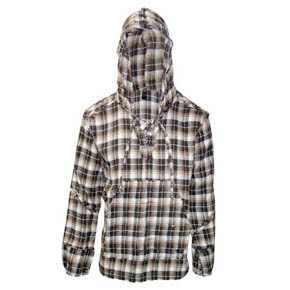 This stylish prewashed flannel hoodie has been distressed for a fashionable frayed texture. 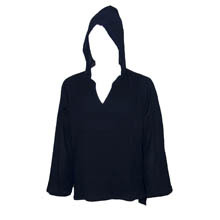 The hoodie features pockets and a hood with tie neck detail. 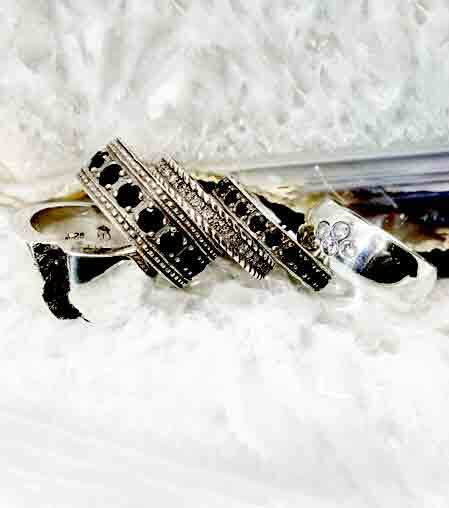 This style runs small, it is recommended to choose one size larger than normal. 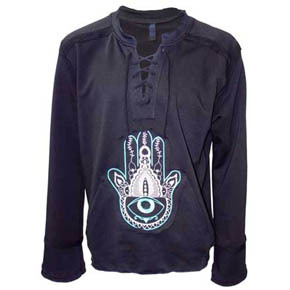 Striking grey long sleeved pullover featuring the fashionable Hamsa Hand design in blue and light grey, symbolizing good luck. 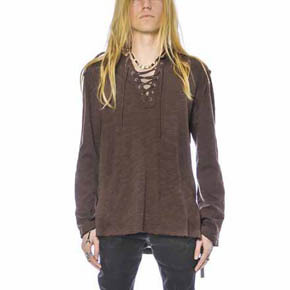 features lace up neck detail and pockets. Made of 48% cotton 48% polyester 4% spandex. Also available in a women's version. Stars are not only the source of light for all the cosmos, but they also produce the elements which allow life to appear and thrive -and life begets art. It is no secret that mystics, musicians and artists and have long drawn from the stars for both inspiration in their work, and perhaps a touch of humility in the face of the infinite. Available in cuts for both Men and Women, this dark grey lace up pullover is made from 100% cotton and allows you to display your affinity for both high-end style, and that which lights our lives. 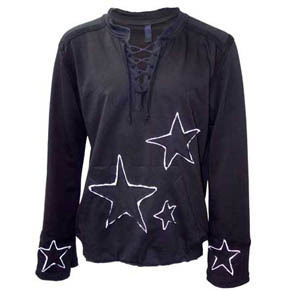 Major Features: This wide sleeved design features pockets, a lace neck detail, and star design. Made of 100% cotton, this unique design is also available for women. Comes in Medium, Large and Extra Large. Made for the rising stars of this world - this piece sports an attitude and demeanor that speaks to both style and confidence. 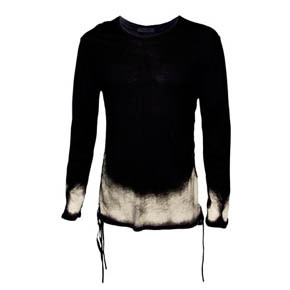 Meticulously designed around a relaxed, aloof feel -this pullover is a comfortable way to make heads turn. 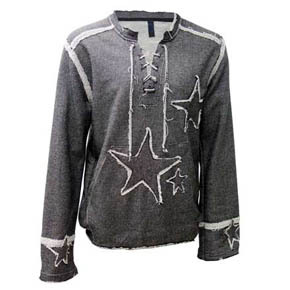 This textured grey and white lace up pullover long sleeved shirt features a striking star design, pockets, a lace neck detail, and star design. Major Features: Grey Embroidered Star Lace Up Shirt. Made of 48% cotton 48% polyester 4% spandex. Comes in Medium, Large and Extra Large. 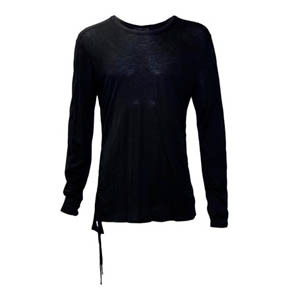 Lazaro men's long sleeved top. 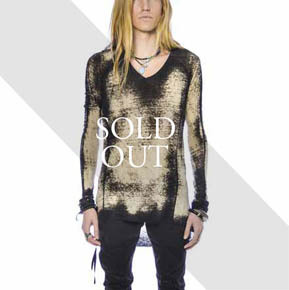 A stylish men's top with a waffle texture material, lightly flared sleeve and adjustable length via feature side ties. Made in Japan of 48% cotton, 48% polyester, 4% spandex. 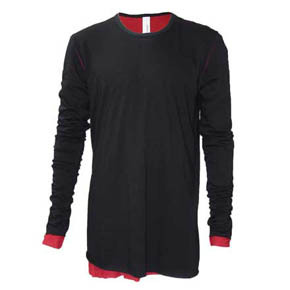 Men's double layered, reversible in red and black long sleeve Tshirt. 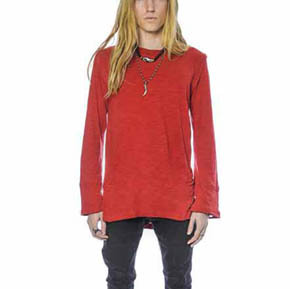 This A.F Artefact long sleeved tee features red stitching and can be reversed to choose either the primarily black or primarily red side. 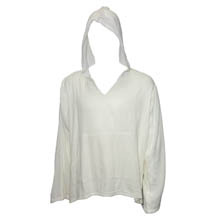 A stylish two-in-one T Shirt made of a eco friendly and breathable 50% Cotton 50% Lyocell mix. 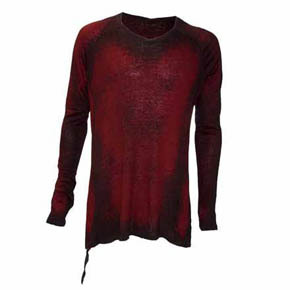 This is a handcrafted long sleeve top from KMRii featuring a distressed look in red and black. Every one of these shirts in an utterly unique creation, as they are each crafted individually. 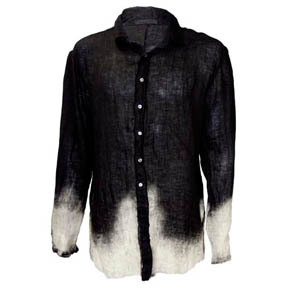 Even the dye itself is handmade in Japan specifically for Lazaro clientele. Your wardrobe deserves a personalized touch, something impossible to replicate- and that is precisely what this long sleeve top from KMRii seeks to do. To set you apart. The contrast of the red and black make for a bold statement. Major Features: Made in Japan. Custom hand dyed color made for Lazaro. Comes in Sizes 4 and 5. Longer in length than typical styles. 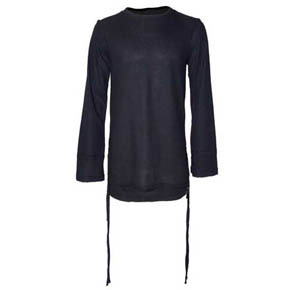 Roam near, roam far, roam across town in this lace-up long sleeve top that will have you roaming all around. Available in three cotton color options: brown, red, and black. From lazy days to crazy days, this cotton flared-sleeve shirt will have the time passing for those who wish to lounge or run about the town. A splash of the KMRii signature discharged print adds the right amount of spice to this long sleeve top, utilizing the neutral black and white to give you one hip shirt. 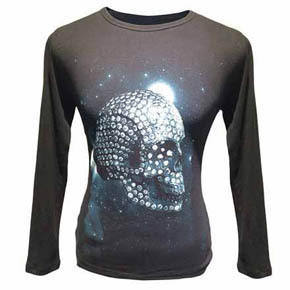 Print of Lazaro's classic skull enveloped by diamonds on a warm long sleeve high quality cotton thermal shirt. 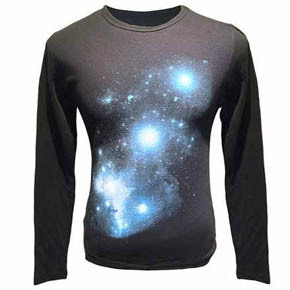 Warm high quality cotton long sleeve thermal shirt featuring a vast cluster of stars on the front.